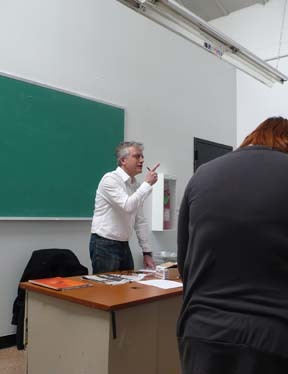 Artist, Designer, Educator Poul Lange (pictured) invited Charles Hively to speak to his class today. The SVA class is made up of graphic design students with an interest in illustration. Hively spoke to the class giving the background of his magazine and books including 3x3, Creative Quarterly, VOIR, the 3x3 Illustration Annual and the 3x3 Illustration Directory and spoke about how to enter shows, how to promote your work as an illustrator and making the choice between being a designer/illustrator and a illustrator/designer. Poul also invited him to critique a recent assignment and answer student's questions about life after graduation. Hively said, "It was great to get in front of a class again, I haven't done that since leaving my position at Parsons two years ago. And it was good to see good work coming out of Poul's class, but then that's what I expect."